Pride goes before a fall. It’s not a saying I like, firstly because why can’t we just wallow in being proud of stuff sometimes, and secondly because I fall over plenty without the help, nay, the luxury of pride (just yesterday I fell up some stairs.) It’s a biblical quote anyhow, and as I’m fascinated by religion but not religious, I guess I can use the old “you’re not my real mom!” comeback here too. In case none of that made sense what I’m saying is that I not only screwed up these amazing pretzel chocolate chunk cookies that I’d planned to make, blog about smugly, and then take to work to make snacking under fluorescent lighting in front of a spreadsheet less bleak…I also, after I had been so pleased with my sleeping progress last time, had a terrible night’s sleep, then this entire week have been far too drowsy to blog. It’s a little harsh knowing that the world actually isn’t going to fall off its axis if I don’t update this blog as immediately as I’d like, but I have so little time and try really hard to keep this ticking over while having a full-time job and it frustrates me to my core if I can’t do that. So. Plenty of pride going before falling this week. But you can’t catch me, mere idiom, because here I am, just awake enough to put my hands on the keyboard and make words and with teeth probably about to float away like the fairy-light seeds of a dandelion from eating almost all of the failed cookie dough which, when frantically spatula’d into a pie dish and baked, made at first a huge puffy mess, but after some healing time and investigative forking, the most delicious, fudgy, crisp, caramelly cookie pie thing. Also I made some dinner that night and that worked, even though it’s really just putting some vegetables into the oven for a bit I would not have been surprised by that point if they’d turned out rubbish, too. Not only did dinner merely not fail, it in fact tasted excellent. 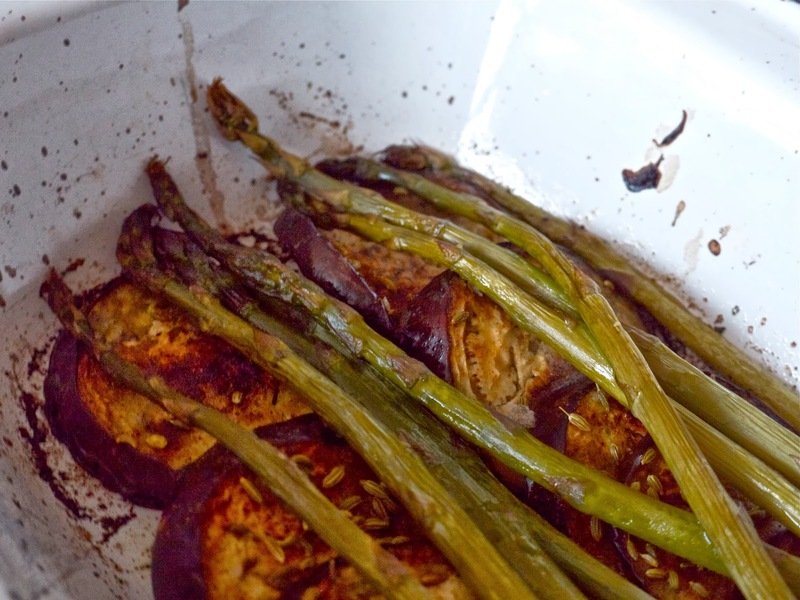 I don’t know precisely which element of this recipe made the eggplant so meltingly delicious – was it the marinating? The slow cooking? Witchcraft? 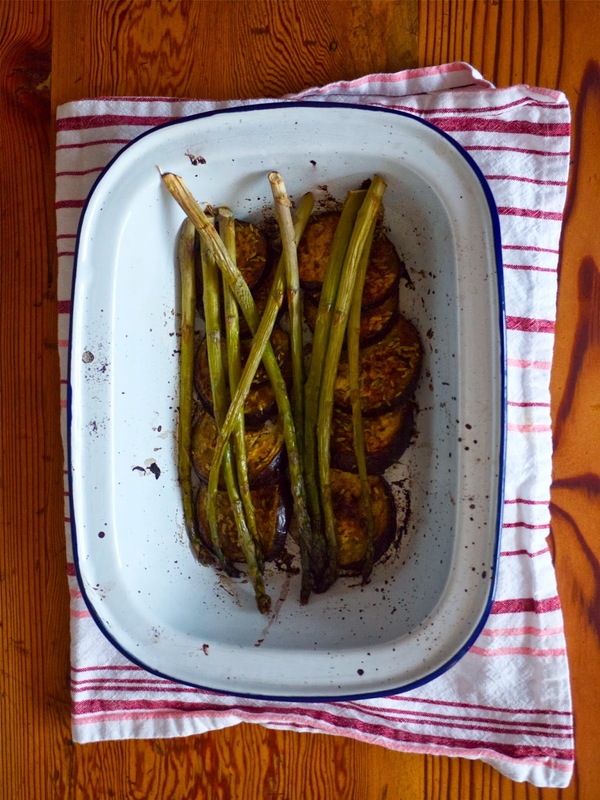 Either way, I got thinking that it might be fun to marinate slices of eggplant before putting them in the oven, so that their spongy interiors could soak up as much flavour and olive oil as possible, which would then intensify in a slow, warm oven, and then get a little caramelised and crisp-edged with a final blast of heat. Whatever: it worked. While this would certainly make a pleasing side (and you can obviously increase quantities based on numbers that you’re feeding) Tim and I had it on its own, on top of some couscous. It was terrific. A recipe by myself. It’s not cookies, but the price is right. Also, serves two. Slice the eggplant into rounds, about 1cm thick. Layer them in the base of a roasting dish and squeeze the lemon juice over them evenly, then sprinkle the spices on top and pour on the olive oil. Leave to sit for ten minutes. 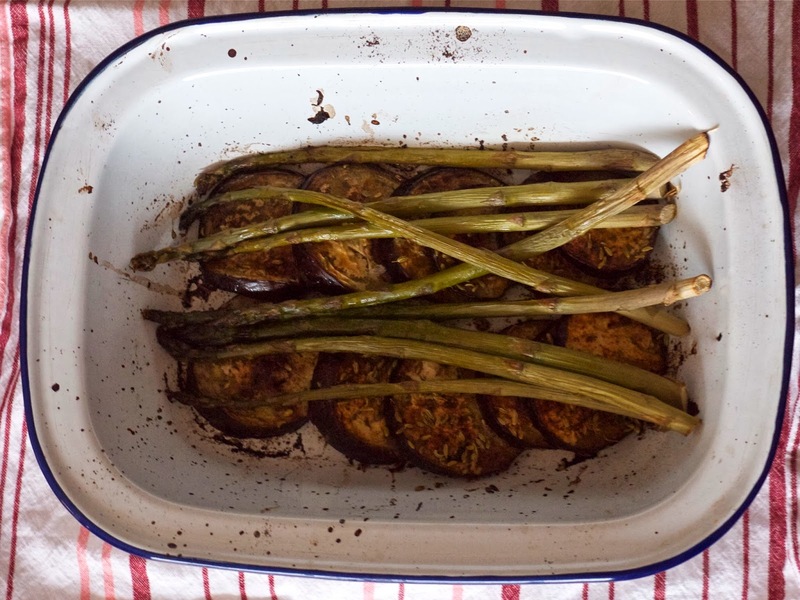 Bake at 160 C for half an hour, then lay the asparagus on top, pour over some more olive oil if you like, and turn up the heat to 200 C. Roast for another 20 or so minutes, till the asparagus looks a little wizened and the eggplant is a toasty brown colour. If you can stand the wait, the eggplant is spectacular when just merely warm, not hot. All salty and dissolving and shot through with the gentle heat of paprika and cumin and just so good. 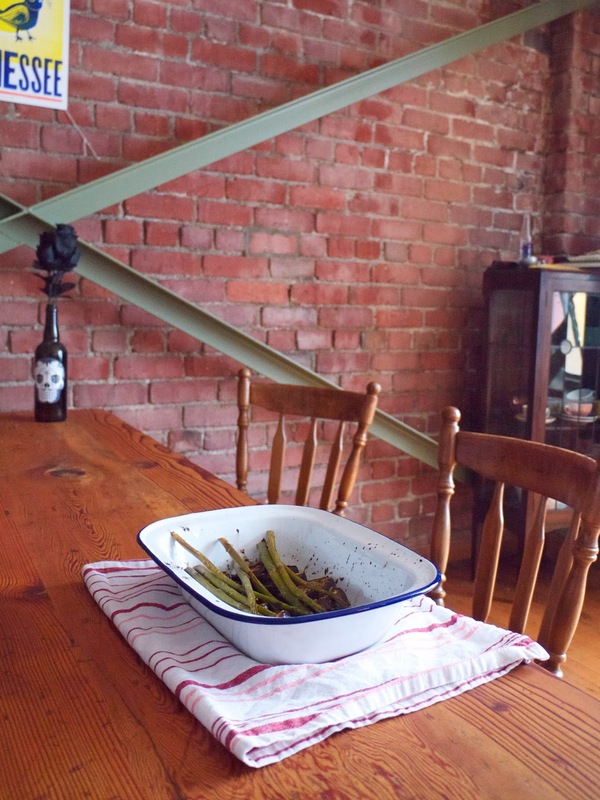 This is not exactly a useful photo of the eggplant dish, but my house was looking really cute in the background so I indulged it. Houses can’t take selfie photos so I was just being a good tenant. So important. If you haven’t read Hyperbole and a Half, the blog from which this book emerged, be kind to yourself and spend all day reading it from front to back. It’s everything. Tim went up to visit his mum and bring home the car we bought off TradeMe (yes, we bought a car, no, the nausea-inducing credit card debt is definitely, definitely worth it, oh yes definitely?) and apparently his mum had some wool she no longer needed and thought I might enjoy. This was my reaction. Snug life! He also brought me back some peonies from her garden after I shrieked at him via txt message that they were the rarest unicorn of them all and like seventeen dollars each in a shop. They’ve mostly stayed alive, which is a small triumph against nature and capitalism and also really pretty. title via: might as well get a case of the morbs with Lana Del Rey’s Born To Die. I love this song so much. Rick Ross ft Lil Wayne, 9 Piece. I really enjoy a shouty chorus. Aaliyah, If Your Girl Only Knew. Sigh. Oh, Aaliyah. Good Morning, from Singin’ in the Rain: my desire to watch re-re-rewatch this movie burns with the heat of a thousand french fries. next time: might even try playing with that failed cookie recipe to see if I can turn it into the caramelly pie it almost became. Make caramelly pie ice cream sammies with the failed cookies! I bet they'd be glorious. Do you ever, at a party or something, start recounting your “best fall stories,” and get to the second or third-best fall only to realize no one is really listening? I've done that a few times. My guess is that doesn't happen to you because your accent is so cute that you're an automatic captivator. I hear ya. I'm blogging less frequently now that I ever have before, because it turns out that working full-time + extra freelance hours + almost 2 hours of commuting every day + socialising + cooking + no light = a life I'm loving but which doesn't facilitate much blogging. But I”m still finding time to READ blogs, so that's something, right? PS I'd prefer your cookie. Just pulling off bits to nibble on all night long? HEAVEN. Awww sending hugs!! I've totally done that though. Announced something and then totally had it fall apart within minutes. Kinda marinated eggplant to the rescue! I always get a happy buzz when I see one of your posts come up in my rss feed. Your efforts to blog through insomnia and worklife are appreciated! I made cookies like that once. Broke them up into giant orbs and told everyone they were “pancake bikkies, a family recipe”. Surprisingly it worked. 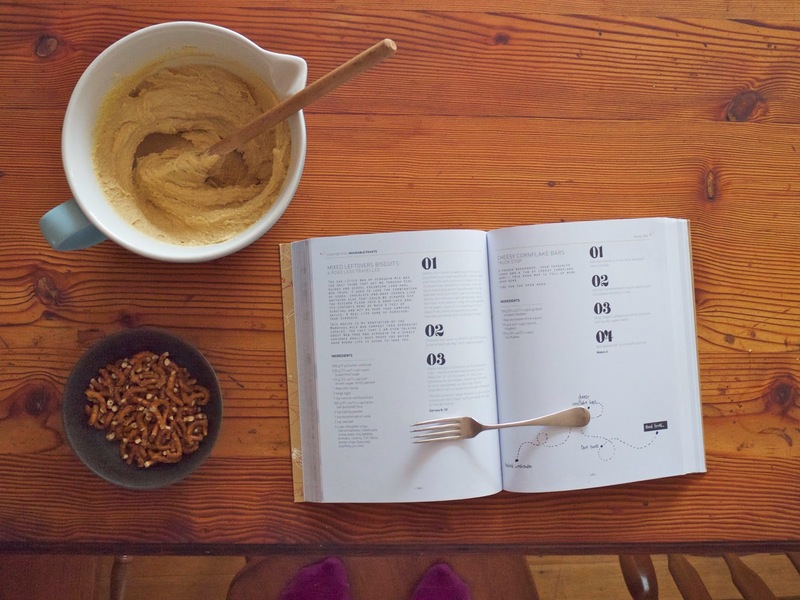 Lies are the most important ingredient in any recipe, that's my motto. <3 <3 thanks you! Also pancake bikkies is an excellent save. Aw, Emma! You do know that in New Zealand we all have this accent though! I have to say, I fall over so often that it's hard to impress people with my best falling over stories anymore. Not another one, they say!